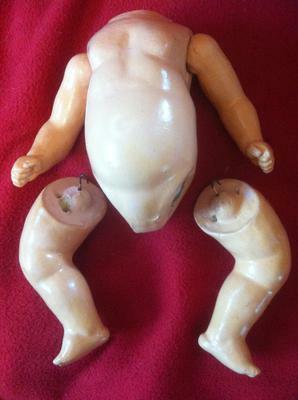 I have the composite baby doll body that belonged to my grandmother. Unfortunately the head was broken by my distraught mother when I was a child and I don't think it was kept. The body is in very good condition. It is about 9 1/2in long (without the head). There is still blush on the knees and unusually the hands are in a fist position. On the back, just above waist level, in figures about 1 cm high, are an S and a 5. Under the top of each arm is a number and I think it is 52. The body was stored in what is propably its its original 'nightgown'. This is made of off-white cotton with cotton lace at neck, around the bottom of 3/4 length sleeves, around the waist and around the hem of the long skirt which is quite gathered and comes down in several points. It buttons up at the back of the bodice. 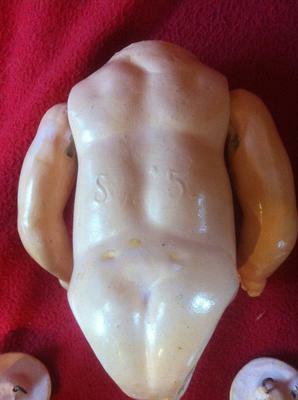 Please can anyone tell me what make this doll might have been?